A recent report called the Cambashi Market Observatories shows a combined growth in the emerging nations of Brazil, Russia, India, and China of 8.6 percent in 2013 over 2012. This is compared with 9.4 percent growth in 2012 over 2011 and suggests the rate of growth is slowing but is still strong. This report comes from Cambashi, a global industry analyst and market consulting firm. Looking at more established markets, the report shows a 5.2 percent combined growth in France, Germany, the U.S., and the UK in 2013 over 2012. This compares favorably with the figure for 2012 over 2011 of 4.2 percent, which is in line with greater recovery and investment in these countries. 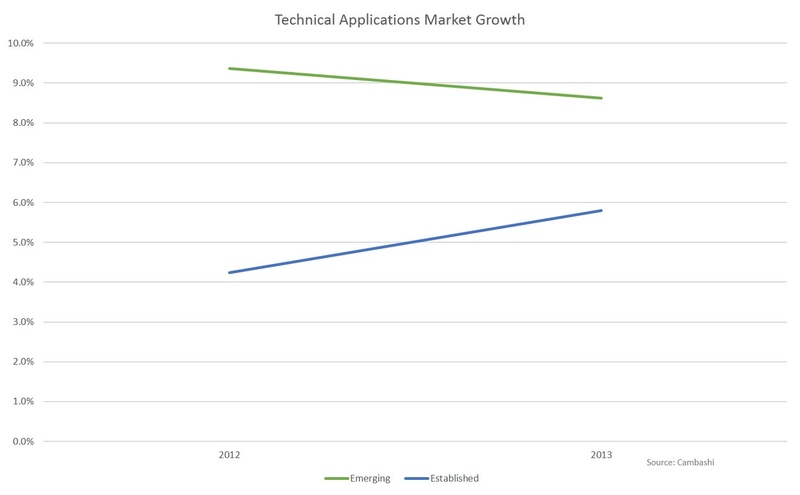 Note that the technical applications software market is dominated by design and engineering software.